Why would I want my photo next to the search results? It's becoming more and more important to stand out from the crowd. You've seen those Google search listings with the author's name and photograph next to the search results. Those results stand out from the others on the same page. It's a good way to increase your credibility, build your 'brand' and improve your click-through rate. Since we published an update to our original article back in January 2014 there have been a couple of further developments. At the end of June 2014 John Mueller, a webmaster trends analyst at Google, announced that they would no longer be showing the author's photo next to their search results, in order to create a "better mobile experience and a more consistent design across devices". He claimed that it wouldn't significantly affect the click-through rate, but some experts were doubtful, and we were inclined to agree. Despite this new development, we decided not to change the remainder of this article. We believed that much of what we'd written was still applicable, and we weren't confident that Google wouldn't reverse their decision in the future. However, at the end of August 2014 Mueller further announced that Google had "made the difficult decision to stop showing authorship in search results", saying that it hadn't been as useful to their users as they’d hoped, and could even "distract from those results". The truth of the matter appears to be that there was insufficient take-up by webmasters of authorship mark-up to make it worth Google's while, especially as, contrary to both our and their expectations, it seems to have made very little difference to the click-through rate. If you've already implemented Google authorship, do nothing. We don't believe that it will do any harm to leave the mark-up in place. If you haven't, do nothing - yet. Google may have another change of heart, and the information's here if you need it. How do I get my photo next to the search results? You'll need a Google (or Google+) account, and you'll need to upload a photograph to your profile. We'd advise a head shot that will remain clear and recognisable when reduced to only 44 x 44 pixels. There don't seem to be any recommendations about the original dimensions, but the image used on the actual profile page is 250 x 250 pixels. 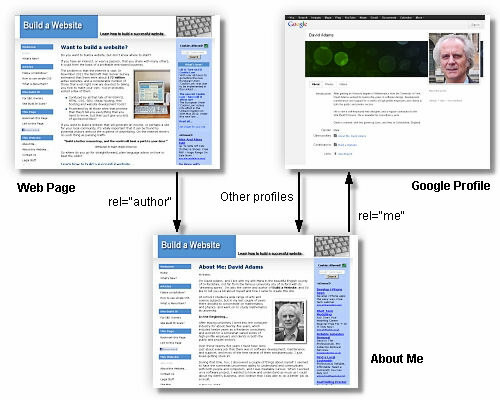 First you need to link from your profile to your About Me page. With your profile open for editing, click on Other profiles, and then Add custom link. Enter the title of your About Me page (or any other suitable link text) and its web address, and save. When you've completed all of the required updates to your profile, click the Finished editing button. This identifies you to Google as the author of that page. 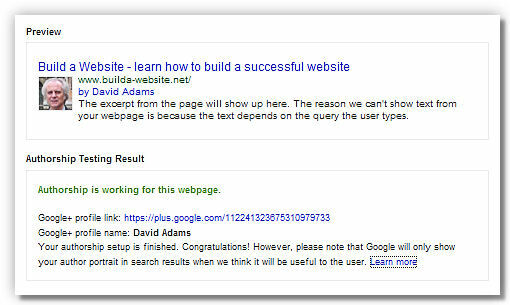 Use the Google Webmaster Rich Snippets Testing Tool to check that you have set up everything correctly. If there are no problems you should see results similar to those that appear below. Notice that Google won't guarantee that your photo will appear next to the search results even if everything is set up correctly. This was always the case, but there appears to have been a change of policy at Google since we first wrote this article, and we'll be looking at this in a moment. Many webmasters are reporting that they're no longer seeing both byline and photo next to the search results. It was always the case that if more than one result for the same author appeared on the same page, the second and any subsequent entries wouldn't show a photo. We want to make sure that the people who we show as authors are high quality authors, and so we’re looking at the process of possibly tightening that up. It turns out if we reduce the amount of authorship that we show by just about ten or fifteen per cent, we’re radically able to improve the quality of the authors that we show. Which is another nice signal for those searchers and users who are typing into Google and say "Ah, I see this picture, I see this person is an author. This is something I can trust. This is content that I really want to see". So it’s not just going to be about the markup; it’s going to be about the quality of the authorship." So it would appear that the secret of getting your photo next to the search results in Google is to ensure that your content is of "high quality", and something that your visitors will "really want to see". What's not clear is whether Google is applying its "quality" tests at page or site level, or indeed across all of your sites, if you have more than one. Any other advantage in having my photo next to the search results? There is another advantage to all of this. The network of links created allows Google to offer its searchers a list of articles by the same author. Here's an actual example taken from the results returned by Google for the search term 'what is altered art'. You'll notice that the first of the two results includes a link to a list of further relevant articles by this author. If you can get a supplementary listing of your pages like this, it's a very good way to bring more of your website content to searchers' attention.